That’s right folks, a mere 4 months from when I started my “Yellow Wall Cardigan”, I have finally bound off, blocked and sewn on the buttons – just in time for the 78 degree weather that is hitting New York. As my devoted readers may remember, this sweater caused me not a little bit of angst back in November. And, evidently, the trauma of unraveling over 2 skeins worth of sweater on my first attempt at knitting this design was not enough of a lesson in checking gauge. On Sunday I found myself unraveling another project for the very same reason. 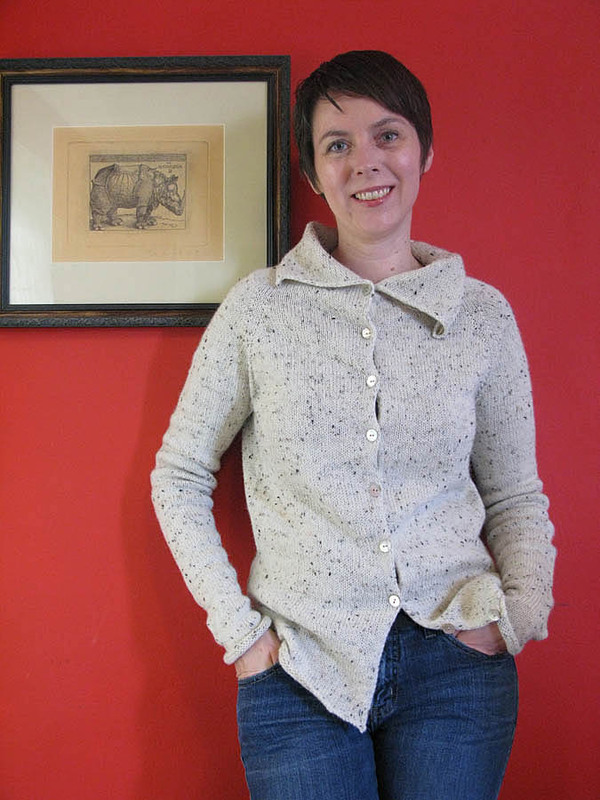 This time it was my lovely “Eggplant Lace Pullover”. 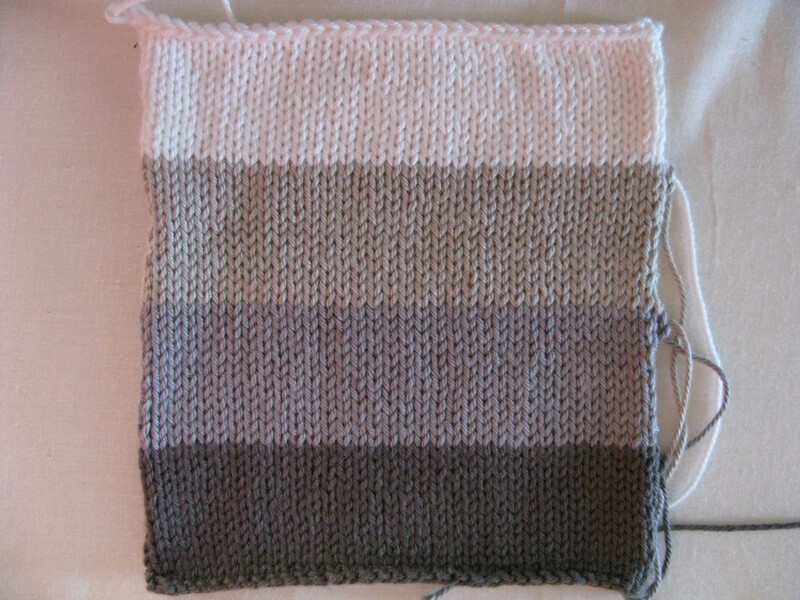 So, that is why I now present to you the gauge swatch for my next project. A nice sized 7″x 6.5″, carefully blocked swatch of Knit Picks’ Shine Sport Yarn in colors (from top down) White, Platinum, Robot, and Wallaby. 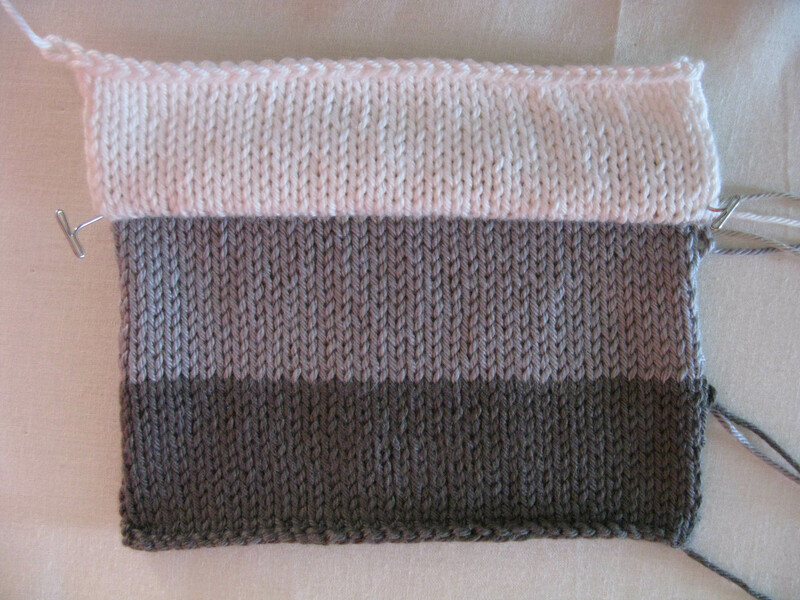 This will be for the “Gradient Pullover” that was featured in the Spring issue of knit.wear. Instead of the pinks that the designer used, I’m envisioning a cotton sweater in neutral tones, perfect as an extra layer on summer evenings. The swatch is serving the dual purpose of helping me decide what three colors I want to use. I think I’ve decided on my color combination, but the gauge is still a little big. I don’t think I’ll bother with another swatch, I’ll just cast on for the sweater on a smaller needle and that should give me the right gauge. Famous last words babe!!! Measure as soon as you can after you cast on so you don’t get 2 skeins in again. And that sweater looks great! Thank you! Too bad it’s suddenly summer in New York and too warm to wear a wool and alpaca sweater.